Higher education institutions must keep pace with the today’s fast-changing world. They must adapt to the evolving demands of the labour market. At the same time, higher education influences and shapes the world as key producers and disseminators of new knowledge. However, higher education must remain relevant and adhere to high quality standards. A new book from the UNESCO International Institute for Educational Planning delves into the important role Internal Quality Assurance (IQA) plays in ensuring quality and boosting employability prospects of its graduates. 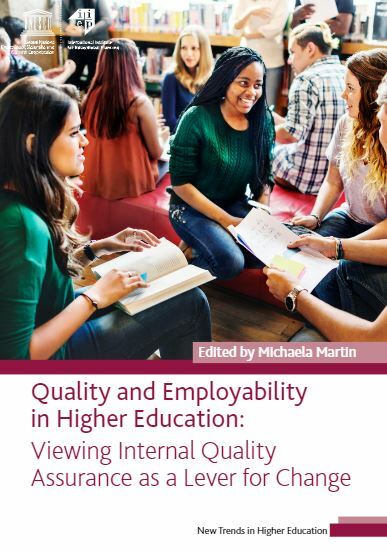 Entitled, Quality and Employability in Higher Education: Viewing Internal Quality Assurance as a Lever for Change, the book argues that IQA enables institutions to identify areas to be improved and to design strategies that respond to needed change. However, national and institutional policy-makers must foster an enabling environment for IQA that involves a broad spectrum of actors, within and beyond the university community. The book includes four chapters that are based on keynote presentations from the 2016 Xiamen Policy Forum, organized by IIEP-UNESCO in collaboration with the Chinese Education Evaluation Centre. David D. Dill starts by describing the conditions under which quality assurance – both internal and external – can lead to quality improvement in teaching and learning. In chapter two, John Brennan argues that IQA must integrate the needs of employability with a longer-term perspective rather than a graduate’s first entry into the labour market. In chapter three, Marie José Lemaitre stresses that IQA – and quality enhancement – should be part of the overall strategic vision of a higher education institution. Finally, in chapter four, Lee Harvey reminds the reader the development of a quality culture should be the most important outcome of IQA. However, he warns that a bureaucratic approach to quality assurance can become an obstacle and stunt quality enhancement by being too rigid. Edited by IIEP Programme Specialist Michaela Martin, the book also includes a number of recommendations for both national and institutional policy-makers to help ensure IQA can achieve its overall goal of quality enhancement. Four Policy Briefs with selected major findings form the research. IIEP is also engaged in extensive training for universities to develop their IQA. IIEP offers online courses on the topic and has also developed a face-to-face format.